The company is well known its A one quality packaging machinery. 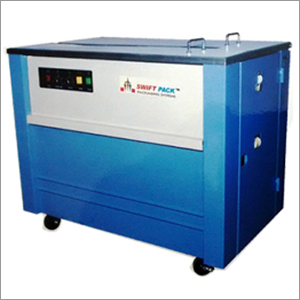 We are specialized in manufacturing and supplying semi automatic strapping machines, used for dispensing, tightening and sealing straps around package. After the strap tightens around the package, it automatically its ends with a secure heat weld. What makes this fully semi automatic strapping machine different is its speed, user-friendly controls, portability, and last but not the least its cost. One can easily avail this type of machine from us, contact us today. As soon as we receive the order, we make it a priority and execute production process 24/7 and provide minimum turnarounds.